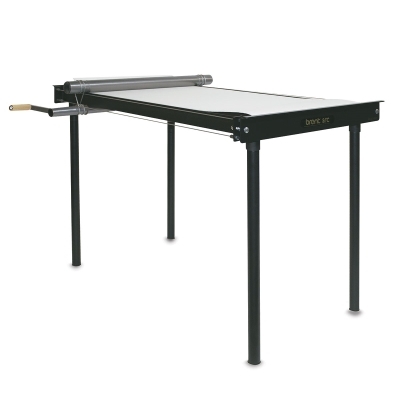 Brent's SRC Slab Roller produces slabs 21" wide × 40" long (53 cm × 102 cm), in thicknesses from 1/4" to 1-1/4;". It's available as either a table model or with easy-to-assemble, screw-in legs. The legs are constructed of heavy-wall steel pipe to provide a sturdy work surface. It stands 36" (91 cm) high with legs. The cable drive with opposing rollers allows use of a lift frame without bed flex. Comes with 6 masonite shims — four are 1/4" plain masonite, one is 1/4" and covered with canvas, and one is 1/8" plain masonite. One year warranty on parts and labor. Shipping weight 180 lb. SRC Slab Roller Handle — Designed with durability in mind, this new round handle allows two-handed operation for increased torque, more continuous movement, and improved ergonomics. The welded steel handle is easy to install. SRC Slab Roller with Leg Assembly — Includes legs. Shipping weight 207 lb. $70 Amaco glaze rebate with purchase.